Remove screws - Screwdriver with steel all the way through the handle, and a steel sriker on the end. 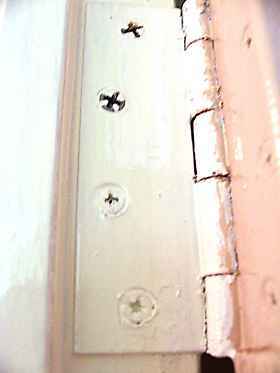 To remove screws like this that are partly clogged with paint is fairly easy. 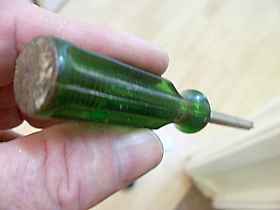 Don't just poke a worn old screwdriver into the head and give it a bit of a twist. Worse still is to do the same with a power screwdriver, the chances are you could spin and wear the slots and make it a lot more difficult job than need be. So, have a bit of patience, don't rush into it. Main tip, get the right size driver, too small or too big makes things worse. The screwdriver in the photo is a bit short for actually drawing the screws, but it is great for what I used it for. It has the steel going all the way through the handle, and a steel button to protect the plastic from splintering. I use this driver to give each screw head a good solid belt with a hammer. In the first photo the top two screws have had this treatment. This shock helps to loosen the screw, and in this case also digs into the paint to form a sharper grip for the real screwdriver. I cheated a bit and used my Makita cordless impact driver for the work, but a good fitting ordinary screwdriver will do the job. The longer the handle the better. I have never really seen it explained well, but it is a fact that longer handles give more power. To remove screws that are slotted I go about it this way. With a recently ground driver (nice sharp edges and if possible steel through the handle) I chip away the paint on the face of the screws, tapping the driver with a hammer to flake it off to expose the position of the slots. I then chip sideways into the slots with the edge of the driver until most of the slot is clean. Again a couple of solid thumps with a hammer and driver to fit the driver to the slot and to some extent shock the screw to break that bond between the screw head and the hinge. Then a longer but equally sharp driver is used to unscrew the screws. If you have a lot of old doors to remove, with plenty of possible problem screws you might want to consider a mechanics tool, a hand held impact driver, which is a short fat steel tool that can take different screwdriver heads. The thing about these are that as you pond the driver with a lump hammer, the tool also imparts a twisting motion to the driver bit, loosening the screw. 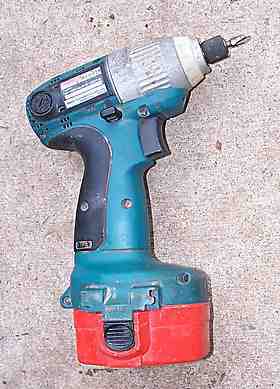 The one I had, I lost a long while ago, and with the Makita Impact Driver I have no need for one. If you remove screws in a systematic way like this you should do OK on most jobs. But what if the slots or sockets are too worn for the driver to grip. Get a lump hammer and a nail punch and try to drive the screw around that way, and then when it is moving you may be able to use a screwdriver the rest of the way. If it is the last one, the others are already out, prise the hinge and the screw off with a big sturdy screwdriver. Fix the damage after. Grind the hinge and the heads off with a 100mm grinder. This is desperate stuff alright, I've never tried it myself. Mechanics and engineers often heat set screws and bolts up with an oxy torch. The expansion and later cooling often breaks the bond but we are getting away from internal doors at this stage. So to recap how to remove screws. Hammer the screw heads to break the bond.